Cape Town has some of the best beaches in the world to offer, so if you're a sand-and-sea lover be sure to take some time out to relax and soak up the sun. From the family beaches on the False Bay coastline to the trendy Clifton beaches on the Atlantic Seaboard - you're sure to find a stretch of sand that suits your fancy. The beaches of Camps Bay, Clifton and Llandudno that dot the Atlantic Seaboard are white and sandy offering beautiful views and spectacular sunsets. Although the water is very chilly, on a hot summer day it does make for a refreshing dip. These are generally the more 'trendy' beaches where many locals spend their weekends. 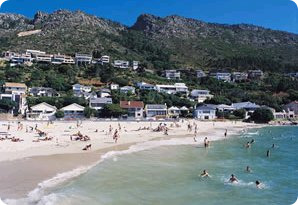 Clifton Beach is made up of 4 coves and the beaches are called 1st, 2nd, 3rd and 4th. 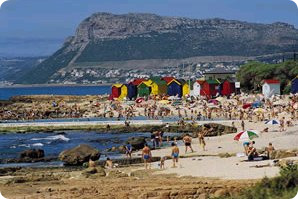 When the summer south-easter blows, the Clifton beaches are usually well sheltered from the wind. All of the beaches are accessible via stairs leading down from the road above. In summer, plan to get to the beach early as parking is very limited. Generally 4th is the busiest in summer with good changing room and bathroom facilities. Kiosks on the beach sell snacks, colddrinks and ice-creams as do the many vendors that wander the beach. Deck chairs and umbrellas are also available for daily rental. If you're on a budget and plan on spending alot of time on the beach - buy your own umbrella as this will save you in the long-run. Clifton 4th is a Blue Flag beach. Originally a small fishing village, Hout Bay is now a favourite with visitors with its traditional harbour and many restaurants and curio shops. The beach is flanked by the harbour on one end and the cliffs of Chapman's Peak on the other. It's a favourite amongst windsurfers, paddleskiers and surfers and is ideal for walking. 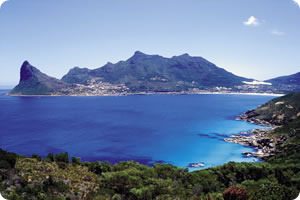 The scenic drive over Chapman's Peak will bring you to the long white stretch of sand at Noordhoek Beach. This beach is ideal for long walks and is also popular for horseback riding, surfing and kite flying. Further along is Kommetjie beach which is also popular with surfers and families. NOTE: Chapman's Peak drive is currently closed until further notice. The popular beaches of Blouberg offer one of the most beautiful and most photographed views of Table Mountain across the sweeping bay. 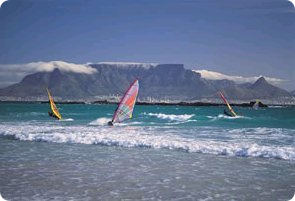 These beaches are popular with families and sports enthusiasts - surfing and kite-surfing in particular are very popular. Also ideal for long beach walks and evening sundowners and picnics. 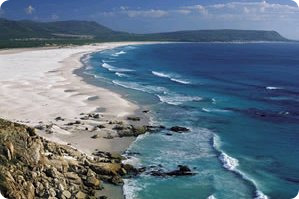 In season - the Blouberg beaches are also a great whale-watching viewpoint. Slightly further a field and approximately 45 minutes outside of Cape Town are the Helderberg region beaches of Strand, Gordon's Bay and Bikini Beach. This stretch of coastline offers spectacular views across False Bay with the Peninsula in the distance. Strand offers a long stretch of sandy beach with safe and shallow waters ideal for children while Gordon's Bay is set in a sheltered bay with rock pools to explore and a promenade for walks. Cafe's, restaurants and ice cream parlours are readily available along the adjacent beachside road. The sandy, white Bikini Beach is sheltered and popular for sunbathing. > Watch a short video clip on Camps Bay beach. > Watch a short video clip on Clifton beach. 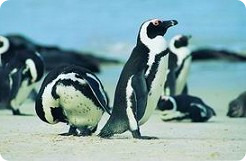 > The South African sun is strong and can be harsh - it is advisable to use sunblock at all times to avoid sunburn. > Petty crime can be a problem on some beaches. Try to avoid taking valuables to the beach and don't leave items such as mobile phones unattended. > Lifeguards are stationed on most major beaches. For your safety swim in designated areas and be aware that there are strong currents at some beaches. 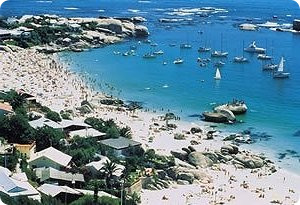 > After a day of sun on Clifton Beach - head for La Med beach bar for sundowners and a light meal as well as great music. 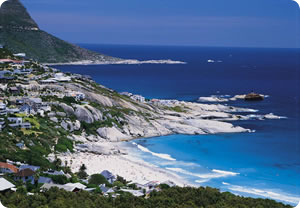 > Llandudno and Blouberg are great beaches for sunsets and an evening picnic. > Early mornings are great for a revitalising walk or jog on Fish Hoek beach - followed by a refreshing dip.